Are you planning a color themed baby shower and don’t know where to start? The usual color themes for boys are blue and pink for the girls. If you are unsure if the baby is a girl or boy choose a neutral color like green or yellow. These are simple themes that can be just as exciting as other themes. Decorate your baby shower venue with your chosen color theme. You can start by selecting your centerpiece which will serve as the base for your color theme and it will become the focal point of the baby shower. 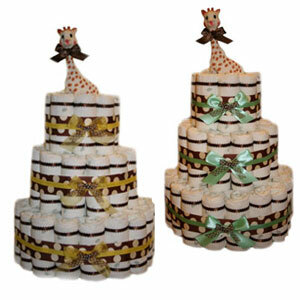 Diaper Cakes make very unique baby shower centerpieces, and are the latest trend for baby shower decorations. 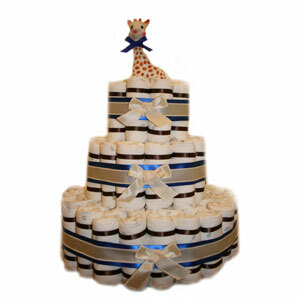 Diaper cakes make the most unforgettable baby shower centerpieces as well as the most practical gift for the expecting mom and the baby. Made from disposable diapers and packed with useful baby gifts like teethers, pacifiers, blankets, onesies and baby creams. GrowInStyle has a diaper cake to suit any baby shower color theme. 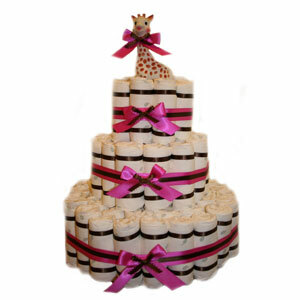 Our Eco Friendly Elegant 3 Tier Pink Diaper Cake will be the rave of any baby shower, and the Elegant 3 Tier Blue Diaper Cake will be a crowd pleaser as well. For those preferred to be surprised admire one of our 3 Tier Polka Dot Diaper Cakes which comes in your choice of green or yellow. Constructed from all Eco friendly organic ingredients with no preservatives, artificial flavors or chemicals. Resembling an actual cake, guests will marvel around the magnificent baby shower centerpiece creation. You might also want to consider using coordinating solid colors to fill out your room decorations. Natural greenery and potted plants adds a nice feel to your shower venue.